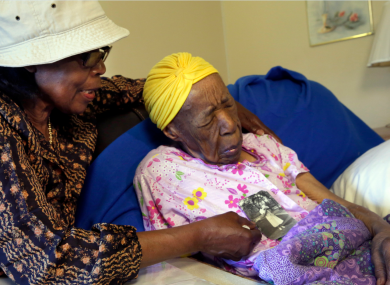 THE WORLD’s OLDEST person, Susannah Mushatt Jones, has died at the age of 116. She passed away in Brooklyn, New York, in a public housing facility for the elderly. She had lived there for three decades. Susannah was born in 1899 to a farming family in Alabama. She attended a special school for young black girls and was sister to 11 siblings. After graduating from high school, she spent a year helping her family pick crops before leaving to work as a nanny. Jones became the oldest person in the Guinness World Records last year after Misao Okawa died in Toyko at the age of 117. Jones lived through some very important historical events in America, including both World Wars. She experienced the Great Depression of the 1930s and the Prohibition era. She was witness to events ranging from the Vietnam War to Neil Armstrong landing on the moon. The invention of antibiotics, affordable cars and radios all took place during her life. Susannah also lived through the Civil Rights Movement and even played her part in creating equality for African-American women. After moving to New York, Jones worked with graduates from her high school to establish a scholarship for young African-American women to go to college. Although yet to be put officially on the records, Emma Morano, from Verbania, Italy, is now the world’s oldest person. At 116, she is just a few months younger than Susannah. Emma is the last person in the world with a birth date from the 1800s. Ireland’s oldest living person, Molly Madden, passed away in January at the age of 109. Email “The world's oldest person has died, aged 116”. Feedback on “The world's oldest person has died, aged 116”.